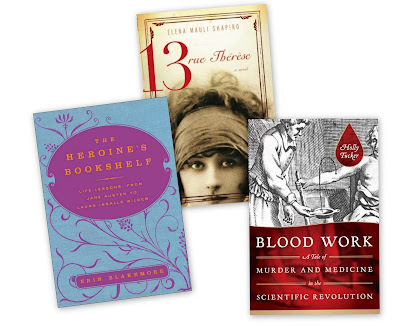 The Sunday Salon [7.17.2011] – my books. my life. I got a little of my reading mojo back this week. Part of the problem was that I felt weighed down by all of the half-read books I had lying around the house. I still wanted to read all of them but it seemed a little overwhelming. Jen from Devourer of Books (the closest thing to a life coach I have) came up with a plan for me and I’ve since finished two of them. I finished The Heroine’s Bookshelf by Erin Blakemore and 13, rue Therese by Elena Mauli Shapiro. And now I am working on Blood Work by Holly Tucker. One of the good things about audiobooks is that even when I don’t feel like reading, I still keep listening. And I have been listening to some fantastic audiobooks lately. 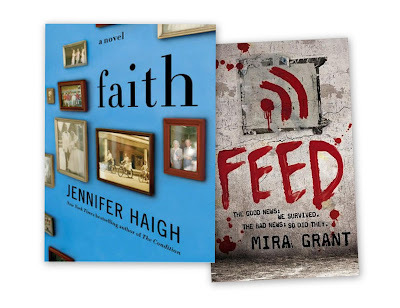 I finished Faith by Jennifer Haigh and I am almost done with Feed by Mira Grant. Both are very good. Ha! Jen the life coach. I can see that! This week is all about Madame Bovary for me. We have an upcoming WOIN show on the lady and an interview with an author, so I am trying to power through. I could use a good life coach. Can I borrow Jen? LOL! I’m a few pages from the end of Everything Beautiful Began After by Simon Van Booy. Once I hit the halfway point, it’s been near impossible to put down! I need a life coach too! I have laid that job down at the feet of my BFF. But she will be no help to me when it comes to getting things read and reviewed. I love audios for the same reason…they just keep rolling, depsite your mood. But I am loving Faith. I’m about halfway done with that one. I like that one your list is a book you borrowed from me and two audios I pushed on you. Maybe we should change my title from life coach to reading dictator. I listened to Feed too and just loved it, and I didn’t think I could like a book with zombies in it. I have the follow up in print.